For his first institutional solo-show in the US, Daniele Buetti creates a site-specific installation that deliberately blurs the limits of the exhibition space. 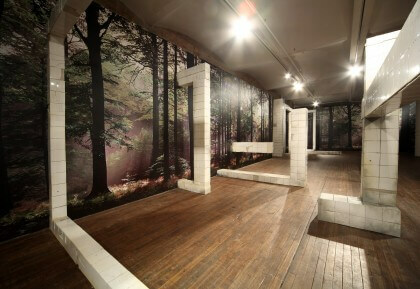 Visitors are plunged into a dense greenwood that reveals geometric ruins on the glade of the gallery floor. Buetti clashes minimal forms with decorative scenery. Sublime and irritating, this encounter makes the viewer not to see the forest for the trees. 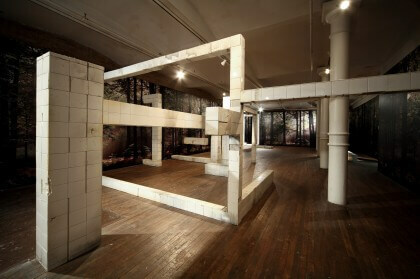 In pairing disparate frames, the artist offers a disorienting trip both simulated and real. An important contributor to Swiss art, Buetti’s work is an expression of world-weariness and the individual’s precarious existential orientation. The Swiss Institute and Hatje Cantz are pleased to release the catalogue “Maybe You Can Be One of Us” to accompany Buetti’s show in New York. It focuses on recent drawings, videos, sculptures, and installations with texts by Jacqueline Burckhardt, Beate Ermacora, Gianni Jetzer, Ferdinand Ullrich, and David Velasco.